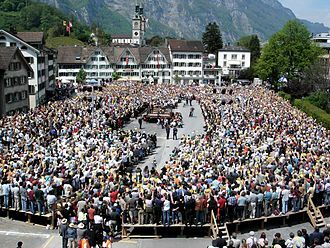 A Landsgemeinde, or assembly, of the کینٹن گلاروس, on 7 May 2006, سویٹزرلینڈ. ↑ A. Democracy in World Book Encyclopedia, World Book Inc., 2006. B. Pure democracy entry in Merriam-Webster Dictionary. C. Pure democracy entry in American Heritage Dictionary"